My mother insisted that I learn how to touch-type in high school and so I spent a summer after ninth grade or so pecking out the obligatory practice sequences. At times I've caught myself being vain about my ability to take notes in lecture on my laptop and still make eye contact with the speaker. That's balanced by the many meetings in which I've taken minutes because it was uncomfortable to watch my colleagues engaged in seek and hit missions to input even simple sentences. And also by colleagues who are utterly unfazed by my scripting proficiency, but who light up when I am able to turn to smile as they walk in without breaking my stride in the e-mail I'm writing, "Hey, you can look at me and still type!" Well, Google has found a way to keep me humble and to break down any remaining feelings of typing elitism. I type in a perfectly formed query, work meaning wired and Google finds it necessary to give me results for word meaning weird (check out the screen shot). My query is meant to find me the Wired article that I read in the UK edition on Thursday about a study that had been done at Duke about the meaning of work. I want to have another look at it so see if I can relate it to issues of worker engagement in crowdsourcing -- work that I currently collaborating with my colleagues on. 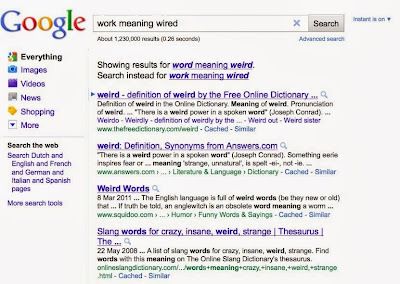 Evidently is what is happening is that the words "work" and "wired" are mistyped so frequently by searchers, especially in the context of the word "meaning", that the probably of me actually having meant to type work meaning wired is vanishingly small, or at least has fallen off the bottom of the Google charts. 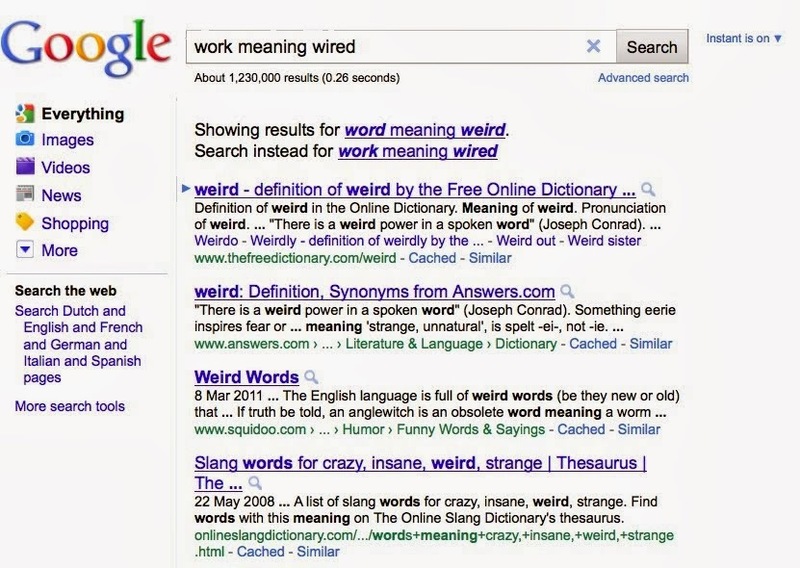 I permit myself a half formulated cuss, well under my breath, and then I type in "work" meaning "wired". OK. Well, my complaint about the wasted keystrokes may not be my only complaint: the extra apostrophes don't get me the article I want either. Vliegendhart, R., Larson, M., Kofler, C., Eickhoff, C. and Pouwelse, J. Investigating Factors Influencing Crowdsourcing Tasks with High Imaginative Load Proceedings of CSDM 2011 (WSDM Workshop on Crowdsourcing for Search and Data Mining), 2011.
reports on a study whose results suggest that work quality is improved when workers are asked to provide explanations for the answers that they provide. In particular, they remain more engaged if they are required to provide an explanation for a personal preference that they have expressed. I would like to try to relate this to worker perceptions of meaning of the work. In the end, I get up from behind the computer and walk the five meters to the chair where the hard copy of UK Wired was waiting and flipped quickly to the page, "At Duke University, when we have run experiments on feelings of "meaning" at work (tinyurl.com/4rwkg85)..." there it is. One last go at Google, I find the article online by typing in the question asked in its final sentence, "How can we enhance the feeling of meaning in those around us?" Maybe I'll start by being more patient with sloppy typists.